We’ve arrived at Yom Kippur again and there is a part of the holiday’s traditions that involves food so it’s an appropriate Foodie Friday topic. Beginning this evening, those who observe the holiday will fast for 24 hours. Traditionally, the meal that follows the fast is “dairy”: bagels, cream cheese, smoked fish of some sort, a sweet noodle dish called kugel, and cakes. The thinking is that a relatively bland meal is appropriate following a fast and the dishes can be prepared ahead since one doesn’t do work of any sort on the day. Hey – if Sandy Koufax can skip work and not pitch the World Series (which made a huge impression on me back in 1965), you and your bubbe can stay out of the kitchen. My family generally had whitefish salad, egg salad, and tuna salad available as well. I know that blintzes are big with some families, although my family was never patient enough to cook them (listen, when you’ve not eaten for 24 hours, even another 10 minutes is an eternity). Everyone would generally grab whatever was available to eat immediately, breaking the fast while their bagel toasted. Most people think of the day in terms of atoning for one’s sins. That’s not quite right in that it’s an incomplete statement. That atonement is only a part of the equation. There is a broader focus on other things as well. One is charity, one is repentance and the other is prayer. Those things can also be interpreted as trying to embody high ideals, returning to those values and ideals if we’ve strayed from them, and self-reflection. Whether you’re Jewish or not, taking a day to think about that three-legged stool is a valuable thing, both personally and with respect to your business. Since this is a business blog, let me focus on the business aspect. Every business needs to give back somehow. Whether it’s mentoring on a pro bono basis or sponsoring a Little League team, it’s not only smart marketing. It’s the right thing to do. Atoning in business is simply reflecting on the times over the past year when you missed the mark and determining to do better. It may be a badly handled customer service issue or it may be treating an employee badly. Identifying those instances and improving the future is a fundamental part of being a good businessperson. And prayer? I’ll leave that to you. I was always taught that prayer is not about you and shouldn’t focus on your wants. I think even atheists can pray since, as Emerson said, “Prayer is the contemplation of the facts of life from the highest point of view.” Not a bad place for any businessperson to be. As I mentioned in this space a while back, we sold Rancho Deluxe. The process of getting it ready for sale forced us to look at every single thing in the place. We made piles. One for stuff we’d keep and, therefore, have to pack and move. One for stuff we’d donate. One for stuff that was worthless and was trash. My old college papers fell into that pile, although I’m not sure my folks would agree with the categorization since they paid for the education. The last pile was for stuff we’d sell. It was an interesting process since it forced us to really think about each item. What struck me was how little we actually kept and how much of what was in that house was just clutter. Of course, each of us has a ton of clutter in our lives, as do our businesses. I’m pretty sure that each of us could do with a decluttering as well. Is your business media of some sort? My guess is that revenue pressures have forced a tremendous amount of clutter into your content. The commercial and promotional load (non-program material) in TV is damn near double what it was years ago. Websites are unusable due to pop-ups, pop-unders, autoplay videos, and other crap that generate minimal revues and maximum anger. The clutter of on-screen graphics has grown to obscure important parts of news, sports, or entertainment programming. The sports business is adding more logos and signage everywhere, ala NASCAR. While I know NASCAR fans are incredibly brand-loyal, I also wonder if there is a certain amount of brand blindness that occurs, much as ad banner blindness is something researchers have found to occur on cluttered web pages. No one watches anything (maybe other than the Super Bowl) for the ads. Look at your inbox. How much email is newsletters you don’t read or email from companies from which you bought something five years ago? How much of your social news feeds is clutter? How about unsubscribing from the former and using mute on the latter? How many companies or people with whom you do business are jerks? How about decluttering and finding alternatives? How many things on your calendar are obligations that aren’t of interest? Maybe decluttering them from your calendar will give you the time to pursue what you really love? I’m still working on this. My fridge is often full of random bits of food that have seen better days and there are clothes in my closet with holes and stains that I keep because of an emotional tie of some sort. Still, I tossed an awful lot of junk and am selling off even more. I’m using the money to buy things I really want (and I know I really don’t NEED much of anything). Worth a try? “The only constant is change” is an old saw, but it got to be so because it’s true. I mean, it was uttered by an ancient Greek philosopher (Heraclitus) and has been repeated for 1,500 years. Change is inevitable yet a lot of us are incredibly resistant to it. We carry that resistance into our business lives as well. Most businesses are pretty good at living in today. They have a grasp on their current situation and have allocated resources to deal with their daily operations based on that situation. A lot of businesses also have a grasp on what will happen tomorrow. They plan lines of succession within departments and train their staff to move up. They allocate capital to grow strategically based on how they see tomorrow playing out. Generally, the short-term doesn’t portend radical change. The problem occurs when you ask businesses (and people) to think about the day AFTER tomorrow – the longer term in which change occurs. In some cases, people don’t even recognize that there will be a day after tomorrow. Try to have a chat with a 23-year-old employee about retirement and the need to start saving today for something 50 years down the road if you want proof of that. A lot of managers guide their businesses based on a series of short-term plans and goals without contemplating the sustainability of their plans over long-term. They don’t embrace change because they don’t want to accept that it’s going to happen. The music business fought change and where are they now? My beloved TV business is going through this now as they continue to deny cord-cutting is a problem and refusing to adjust to this massive change. On the non-business side, I believe that many of the challenges our country faces are due to the refusal to accept how our demographic and economic base has changed. That refusal, both in business and outside of it, sparks fear as the signs of change become more prevalent. It’s really only traumatic, however, if we try to resist rather than accepting change and planning for it. I believe in controlling your business. That means you need to contemplate change, accept it, and revise your plans before change happens to you and not because of you. Things happening due to circumstances beyond your control should be rare if you look to the day after tomorrow, embrace the inevitable change, and having a clear picture of where you’re going, not clinging to an unreasonable and unsustainable changed past. Make sense? It’s Foodie Friday and I have unintended consequences on my mind. What spurred that were a couple of food-related things. I went to do some research about an alcoholic product and of course, I was asked to verify my age before being allowed to read the brand’s website. I assumed that was some sort of regulation imposed on beer, wine, and booze makers since it’s the sort of thing I caution clients about doing all the time: preventing the user from completing their task as seamlessly as possible. As it turns out, there is no rule requiring alcohol brands to do this. What it might do, however, is deter the very people who should have more information about alcohol – young people – from getting educated. This is an unintended consequence. If they lie about their age to gain access, you’ve also caused them to violate the Computer Fraud and Abuse Act, and making them break the law is another unintended consequence. As mobile food delivery apps like Seamless, UberEats, Caviar, and Postmates steadily expand their delivery zones and their customer bases, many restaurants are increasingly relying on delivery orders as a significant source of revenue — and they’re having to adapt operations accordingly to keep up with demand. The unintended consequence here is that restaurant personnel are often spending so much time servicing the take-out business that the customers seated in the dining room have a lesser experience. Putting aside the fact that there is the potential for a restaurant’s reputation to suffer when the product delivered is way inferior to the product in the dining room, a failure to properly prioritize the kitchen to service the folks who have journeyed to the dining room could set up a lose-lose situation, with neither the folks eating at home nor the people eating out being satisfied. There is also the stress caused by having to refine the operations plan to support the take-out business. 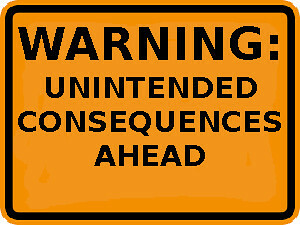 We see unintended consequences all the time. Kudzu went from being an ornamental plant to a menace. When the British governor of Delhi, India addressed a cobra infestation by putting a bounty on cobras, they got more, not fewer, snakes, as people raised them to collect the bounty. I’m sure you’ve seen examples in your business of this, whether it’s a different response to a price change than what was anticipated or a sudden wave of popularity of a brand or product based on some bit of social media madness. Whatever it is, it’s incumbent on all of us to think about every decision in the context of what the effects of a course of action might be. Who is affected and how? How will it affect competitors and what might their possible responses be? Do this more each alternative you’re contemplating and your odds of avoiding an unintended consequence will improve. You with me? One of the roles I play along with my regular consulting gig is an advisor. I am what’s call a “Navigator” at one of the oldest incubators in the area. Each month, the Navigators get together and listen to a pitch from a resident company. It’s good practice for them (you can NEVER have enough practice pitching your business) and it’s good for us to become better-versed in what’s going on. Most of the companies headquartered at the incubator are engaged in scientific research of some sort and there are a lot of Ph.D.’s wandering around the building. They know a phenomenal amount about their fields and about the company they’re germinating. The problem is that they don’t seem to know that they’re building a business and not a science experiment. We had one of these get-togethers yesterday and I was speaking to another Navigator, comparing notes about the companies we’ve seen and the pitches we’ve heard. He had found, as had I, that most of these very smart entrepreneurs had no trouble explaining the nuances of some very complicated science but had massive difficulty in explaining how they were going to make money. A book from a few years ago wrote up research that found that 87.5% of Millennials disagreed with the statement that “money is the best measure of success.” On a personal level, I couldn’t agree more with their thinking. There ARE many more important things in life that reflect success and failure. On a business level, unfortunately, that’s dead wrong. When you raise capital, your ability to provide a return on that investment – i.e. money – is the measure of success. Otherwise, you’re not a business: you’re a charity. Since these entrepreneurs – almost all of whom are Millennials – claim to be building businesses, part of what I and the other Navigators help them do is to focus on the business of their business and not just on the science and their products. We ask them the kinds of questions I hope you ask yourself. What problem are you solving? Who else is solving it? Why is your solution better? How much will it cost to build your product at scale? How is it priced? What is the profit margin? What’s the competitive set in how big a market? Pretty basic questions, I know, but these are smart people who have never been asked them before. The ones that can answer them clearly are the ones that will get funded and survive. Do you fall into that group? If you’ve spent any time reading this drivel, you’ve probably seen my constant nagging to provide value by solving problems. No, I’ve not changed my thinking about that, but I’d like to put one stipulation on the statement: make sure that the problem is real. I’m thinking specifically of those people who have hero syndrome. Not the seriously ill type such as the firefighter who is also an arsonist, lighting fires so they can save the day. I mean the people who are constantly solving problems that don’t exist. I used to work with someone who would stick their head in my office and report that some client or partner was having an issue. They also told me not to worry – they were on the case and would handle it. Phew! Of course, it was rather odd when I mentioned to one of the “saved” partners that I was happy that my team member was able to solve their issue and the partner had no clue what I meant. Fortunately, the “hero” in question moved on not long afterward. The other side of the equation is also true. There are people who are the “go-to” people in various areas and who become indispensable, so much so that their mental and physical health can suffer because they don’t want to disappoint anyone. It’s another aspect of hero syndrome. They feel as if they won’t be appreciated if they ask for help. Instead, they often become bitter, burnout, or both. How do we handle people with hero syndrome? First, make sure the problems they are solving are real and are worth solving. Not everything is a crisis, you know. Second, make sure that they have the resources to solve the problem quickly, efficiently, and completely. Sometimes for those of us who were higher-ups, it means getting your hands dirtier than usual, often doing work for which you’re overqualified. I always felt as if I was paid to be everyone’s safety net, so if it was a job I could do, I did it. I have plenty of paper cut scars from making last-minute copies and assembling binders when I was needed. Finally, pay attention to the folks who are constantly being heroes. Make sure they’re not lighting the fires they’re busy extinguishing. Make sure no one is constantly backlogged with work and everyone knows it’s OK to just say “no” when they’re overwhelmed. Those times are when those of us in management earn our pay. It’s Foodie Friday, and I want to relate an experience I had the other night while dining out. It got me thinking about some dumb things folks in the food business do and how any of us in business can be smarter than they seem to have been. I went to get a burger at a local bar that serves excellent food. They grind the burgers themselves out of a combination of several cuts of beef and they cook it nicely. It’s perfectly seasoned and is served on a bun that absorbs the juices without falling apart. I order mine with bacon and a runny fried egg (why not have breakfast with your burger?) but they offer many other options. It’s a work of art: the Mona Lisa of burgers. When the burger came the other night, I asked the server for some mayo to dress the bun. They used to serve a lovely house-made truffle aioli but the menu has changed and now it’s just mayo. What I got was a handful of packets of mayo. You know – the shelf-stable, room temperature stuff you’d get tossed in your bag at a deli for your take-out sandwich. I was shocked and felt like whoever made the decision to serve their condiments as if we were in a concession line someplace was disrespecting the customer, not to mention their own product. They had put a mustache on the Mona Lisa. It got me thinking. How could these people compromise the excellence of their product by doing something so silly? Then again, we see plenty of examples of this. Ever notice a water bottle that claims to contain “gluten-free” or “non-GMO” water? It’s another example of a business showing their customers disrespect. You assume we’re too dumb to know that water couldn’t possibly contain those things. I’m sure you’ve seen ads for “hormone-free” chicken. Well, yeah – the law prohibits the use of hormones. It’s fake transparency or worse because it shows a contempt for the customer’s lack of knowledge. Do I think the bar serving me a packet of mayo is as bad as misleading labeling? No, but both actions come from the same place, one we all need to avoid in business. We need to honor our products and services but first and foremost, we need to honor our customers. I get that this is probably nothing more than a cost-saving measure, but I’m also sure there is mayo in the walk-in and putting a spoonful into a little cup may cost a few cents but is more in line with both the quality of the product and the customer’s expectations. Make sense?